Well for those of you who do not know, the tarantella is an old Italian dance. Its origin is said to be in the Italian town of Taranto - as a sort of music therapy. People who were bit by a tarantula would continue a fast paced dance (the tarantella) to certain music until their body was rid of the spider's venom (I'm guessing through perspiration?......sounds strange to me). It even evolved to have a 2 partner version which is different depending upon the regions of Italy. Even the music can vary from place to place. Well perhaps the most well known of the varieties is a group dance....and for this one, you round up as many Italians you can find, and join hands in a big circle. Everyone dances in one direction until the music changes and then you switch directions. All the while, as the music speeds up so do the dancers. It is quite a sight to watch, and quite a workout if you're involved! But it's a blast, and an Italian wedding without it is just plain boring. 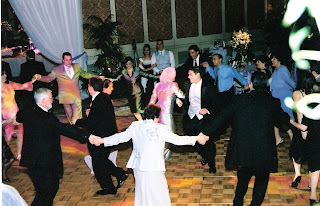 Above is the tarantella in action at my own wedding. A few people (my mom and my brother) even got inside the circle, which was a riot. Not as funny, though, as my 80 year old grandma keeping up with the crowd! Of course, you don't have to be Italian for this one, so find an excuse to try it....If you're Italian you know what I mean. If you're not, then crash an Italian wedding. Can't find one? Meet an Italian and marry them. (Despite all the "proverbs" its not that bad) Because believe me - it's one of those things you've got to try at least once in your life. And who is that luck Irishman holding hands with your Grandmother? I just realized I am in that pic! Whoohoo I made the blog. Honestly though I love that dance. Every Italian wedding I have been to incorporates the tarantella into the night's festivities. However it also seems that no one quite knows how to do it, which is great for me as I stumble along with everyone else. Are there any other festivities that include this dance? the way things used to be, Italians had music at EVERY celebration. Be it a baptism, a first communion, a birthday, or anniversary - music and dancing were there. And where there's Italian music - there's the Tarantella! We've all seen that scene in The Godfather where everyone is outside dancing the Tarantella! THat's the great thing about Italian family get togethers: a simple meal to honoe a special occasion becomes a grand party because of the people involved! Do you have a video of your Tarantella? Our daughter's wedding is in two weeks and we have three variations of the Tarantella. My family's is similar to the Godfather. Also, our DJ has a terrible version of the music.